Anger can be controlled. 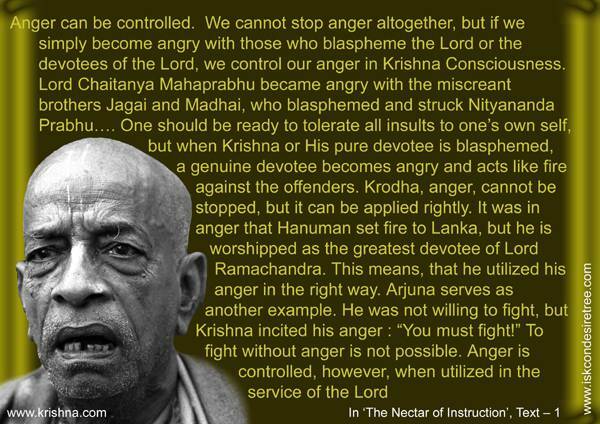 We cannot stop anger altogether, but if we simply become angry with those who blaspheme the Lord or the devotees of the Lord, we control our anger in Krishna Consciousness. Lord Chaitanya Mahaprabhu became angry with the miscreant brothers Jagai and Madhai, who blasphemed and struck Nityananda Prabhu…. One should be ready to tolerate all insults to one's own self, but when Krishna or his pure devotee is blasphemed, a genuine devotee becomes angry and acts like fire against the offenders. Krodha, Anger, cannot be stopped, but it can be applied rightly. It was in anger that Hanuman set fire to Lanka, but he is worshipped as the greatest devotee of Lord Ramachandra. This means, that he utilized his anger in the right way. Arjuna serves as another example. He was not willing to fight, but Krishna incited his anger; "You must fight!" To fight without anger is not possible. Anger is controlled, however, when utilized in the service of the Lord. — The Nectar of instruction, Text 01. Think about all that is being missed in our Krishna Conscious life just because we adhere to the one impurity called sexual impurity. Or conversely, think about what we could do more in Krishna Consciousness when we get rid of this impurity. We would be more enthusiastic and less offensive. We become angry & offensive when our desires are not fulfilled. People have many myths about anger that cause them to categorize the issue in a certain way. For instance, some people consider anger to be biological or hereditary, but this myth does not have any solid foundation. Although some people are more prone to anger due to their psychophysical make-up or emersion in the modes of passion and ignorance, their socialization or quality of association will have a greater impact on their reactions. Although we do bring forth other infl uences into a situation such as our karma, which affects the ways in which we respond to specifi c situations, it is a myth that anger is biological and a permanent, unchangeable aspect of the body. Anger is like fire, it will burn all good qualities if not subsided in the initial stage.